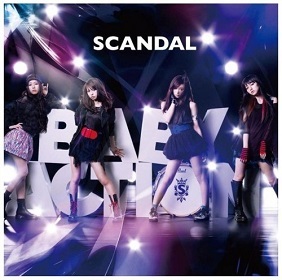 This is the 3rd album of SCANDAL, and their first album that they didn't wear their school uniform costume for their album cover. With this new image, SCANDAL rock the world with 12 tracks. For they who buy this album, Burn is a good start to listen (this song used in the Japanese Horror Movie Rabbit Horror 3D).One of the song, Pride, can be previewed from their YouTube channel, although they still use their school uniform in this music video. For people that follow SCANDAL from indie maybe will notice that there are some changes and evolution in SCANDAL's songs. Most songs for this album are slightly heavier to pop. There are a larger range of music in this album. From the upbeat and fun songs like Glamorous You, Sono Toki Sekai Wa Kimi Darake No Rain and Sparkling to the harder rocking songs Love Survive, Pride, SCANDAL Nanka Buttobase to the slow ballad-like pieces Burn, Haruka and One Piece, and even a number reminiscent of the Japanese music scene during the 60s and 70s, Tokyo Skyscraper.